Lively prints combine with a waterproof nylon shell fabric and tons of toasty insulation to warm up the coldest winter days. 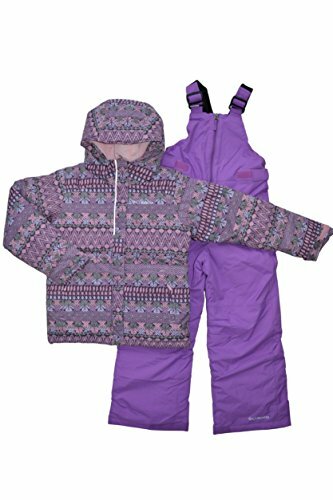 This cozy winter jacket for girls features a taffeta-lined hood that's soft against the skin, a high collar, and angled cuffs designed to protect the wrist and top of hand.Durable and warm, these waterproof winter bibs are insulated with 60 grams of naturally breathable and quick-drying polyester. Bib snowpants are Ideal for staying comfortable and protected in cold weather conditions, they also feature our OutgrownTM grow system, which makes it easy to extend the length of the inseam as she gets taller. If you have any questions about this product by Kids Columbia, contact us by completing and submitting the form below. If you are looking for a specif part number, please include it with your message.